With a tinge of adventurous experience and a wagon load of mesmerizing sceneries, Shimla is carved with the whole shebang that is basic for a getaway to loosen up and unwind.The exalted snow-covered mountains, impressive rich green foliage, prepossessing lakes welcome you to delight in their undying beauty. The sundry tourist attractions in Shimla hold on to a magic in the air that is beyond comprehension and comparison. One of the unique characteristics of Shimla is that you can visit the city anytime in the year.The best time to visit Shimla is from October to November and from March to May. Winter commences in October and continues till February. Temperature drops to as low as -2° C in peak winter. However, the climate tends to be quite cool, pleasant and refreshing during October. 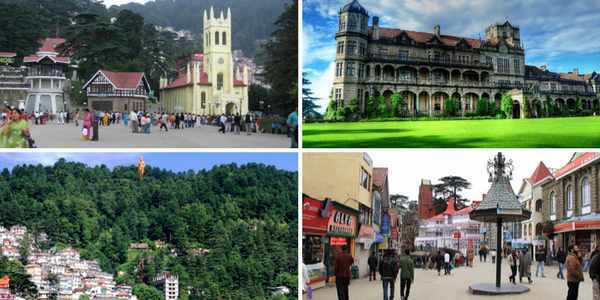 Here are some top-of-the-line crowd-pleasers in Shimla that ideally remain extant in every tourist’s travel plan. Kufri is one of the most favourite tourist haunts in Shimla. It’s situated at an altitude of 2622 meters above sea level and 19 km away from Shimla. The snow clad mountain ranges and the transfixing beauty of nature along with a plethora of adventurous activities like hiking, skiing and appreciating nature’s charm and grandeur make Kufri one of the prime hotspots of Shimla. The Ridge, a boundless open space, is located exactly at the central point of Shimla. The place is prominently known to convey some bewitching snow scape of the mountains.The Ridge merges with the Mall road on the western side at the “Scandal Point”. On the eastern side of the Ridge lies the Lakkar Bazar, a market famed for its beautiful wood crafts.The Ridge is almost like a paradise on earth to all mountain lovers. The Shimla State Museum which was inaugurated in the year 1974 a top Mount Pleasant is abounding with paintings,sculpture sand other exhibits revolving around local art, culture, archaeology and anthropology. The colonial architecture of the building in the middle of splendid lawns is in itself a striking spectacle that reminds you of the city’s illustrious past. The exhibition hall boasts of 9000 objects in its galleries of a collection. This place is perfect for an adventure sports freak. Right from the British colonial rule, Annandale, basically a tableland is popular as a typical sports arena especially for golf, polo races and cricket. It’s a refuge for golf lovers and displays an ideal treat ostentatiously to the tourists by enthralling them with its eye-snappy magnificence and quaint scenic views. At an altitude of 2455 metres, Jakhu hill is the highest point in Shimla. The place is home to ancient Lord Hanuman temple atop the hill.Take a dekko at the mammoth 108 feet Hanuman idol that sparks off telltale aura and opulence. There is the much sought-after Jakhu Ropeway that offers a spellbinding view of the temple, the mountains and the profuse green woods of deodar trees. You can alternatively trek, hire a pony or a taxi to reach the temple. You’ll see a lot of monkeys in this area. However, they don’t create any trouble. They simply accept food from the pilgrims. The sanctuary is located around 150 km from Shimla near Rampur Bushahr in the high elevation terrain of Shimla. In the early times, the forest served as the hunting ground of the native royal family. It was classified as a sanctuary in the year 1962. Daranghati has a suitably settled forest and is a bonafide escapade for trekking freaks.The wildlife includes tragopan, koklas, monal, musk deer, ghoral, thar and Khalij pheasants.